"Yamaha synthesisers are the perfect combination of versatility and quality. The Motif’s Piano and Rhodes samples are the best in the business, and the acoustic instruments and synth libraries are very comprehensive. But for me, the standout feature is the integration of all of these sounds into a powerful workstation, which allows me to split and layer multiple voices, create signal chains with insert effects, while adjusting parameters in real-time. 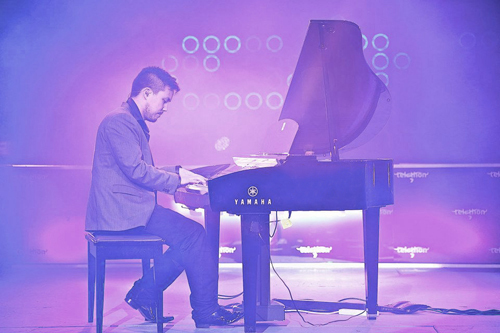 In a nutshell, Yamaha workstations give me the power to perform live in a huge range of styles, and be confident that it will sound world class every time… exactly as it should!" Michael Tan is a Perth-born musician and producer, who has made Sydney his home since 2012. Since this time, he has produced and co-written numerous ARIA-charting singles and albums, for artists such as Dami Im, Anja Nissen, Johnny Ruffo, Chelsea Basham, Omar Dean, Karise Eden and Fatai, and his productions have featured on Channel 7, Channel 9 and Disney Channel. Outside of the studio, he currently plays keyboards for Steve Clisby, Shannon Noll, as well as being Musical Director for Dami Im on her upcoming 2016 tour. Michael’s speciality is his ability to integrate pop productions into live stage performances, with extensive experience in arranging for strings, BVs and brass, from small bands to full orchestras. Michael also holds a Masters in Clinical Audiology and a Doctorate in Psychophysics, and has a keen interest in acoustics and music technology.